About the game Just like the traditional game stick a tail on the donkey, except the game has been changed to provide fun specifically for a hen party. Each player must try to stick their bouquet sticker nearest to the target / brides hands, after spinning round 3 times blindfolded. (blindfold not included simply use a tea towel or scarf). Contents Large A2 premium poster 20 x bouquet stickers. Instructions explaining exactly how to play the game. 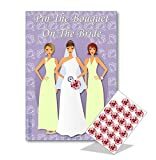 Key features Large A2 size premium poster Bouquet Stickers provided!